Our Ground-Breaking Research: Smarter Cities 2025 | Econsult Solutions, Inc.
Over the past ten months, ESI’s team of thought leadership experts, coupled with a coalition of leading providers of smart city services and research partners, worked on an extensive study examining the impacts of smart city solutions on urban performance. For our recently released program, Smarter Cities 2025, our team conducted surveys on 136 cities located in 55 countries across the world. The cities ranged across various levels of economic development, from least developed to highly advanced. They also faced different urban challenges, such as high crime, poor infrastructure, pollution growth, and demographic shifts. 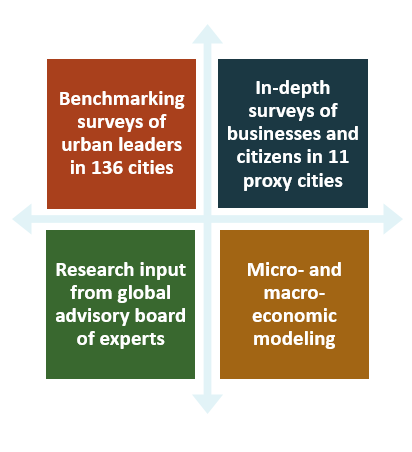 To gain insight into the views of city stakeholders, we also conducted surveys of 750 business leaders and 2,000 residents in 11 representative cities with varying levels of economic development, social and geographic diversity, and smart city “maturity”. Based on the overall derived maturity score, we stratified the cities into three categories: beginner, transitioning, and leader. We then analyzed and correlated the statistical input from the governments, citizens, and businesses to understand the alignment in ways of thinking about smart cities. Drawing on the survey data and respected secondary sources, we then created micro- and macroeconomic models to quantify the direct, indirect, and catalytic benefits of smart city investments in the 11 representative cities, which could be extrapolated to cities with similar characteristics. Throughout the research process, our distinguished advisory board of business and academic leaders provided valuable input on smart city practices and their impacts. 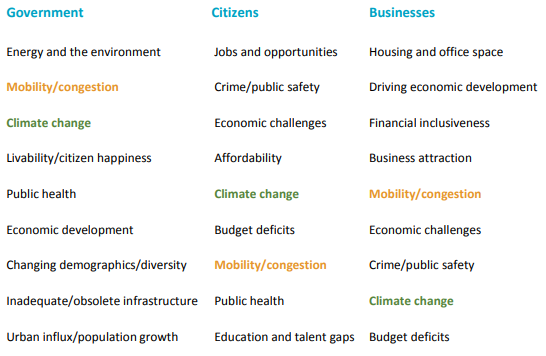 While government, businesses, and citizens have different perspectives on the problems facing cities, climate change and mobility/congestion are near the top of the list for most stakeholders. That may help explain both the expectations for future development of mobility and environmental applications, and the willingness of both citizens and businesses to pay more for those investments. Technological innovation is progressing faster than many cities can react, but by making their cities smarter—not just in using technology, but in all that they do— government leaders hope to drive competitiveness and growth, while making massive social, business and environmental improvements. As cities advance along the maturity curve, they are better able to reap the benefits of investments in new technologies and systems. With a sound governance structure, sufficient financing, and talented workers, cities will be able to better capitalize on investments in smart innovation to generate new revenue streams and cost efficiencies. At the same time, smarter cities can potentially increase economic activity and livability for citizens and businesses. In the end, successful cities will morph into digitally-enabled hotbeds of innovation acting as magnets for future talent, performance, and improved conditions. Those cities that fail to keep up run the risk of falling even further behind the competition for capital, talent, and economic growth. The path will vary by city— depending on the issues it faces. We hope our research will offer a clearer path here in the Greater Philadelphia region, and across the globe. Learn more about the Smarter Cities 2025 program and access our ebook and benchmarking tool by clicking here. ESI ThoughtLab is the thought leadership arm of Econsult Solutions, Inc. The team provides fresh ideas and evidence-based analysis to help business and government leaders cope with transformative change. We specialize in analyzing the impact of technological, economic, and demographic shifts on industries, cities, and companies. 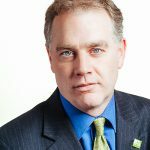 Steve Wray is a vice president and director at Econsult Solutions. Mr. Wray leads projects focused on regional economic competitiveness and civic strategy and policy. 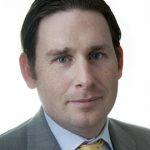 He brings to ESI’s clients extensive experience connecting the public, private and non-profit sectors with analysis and strategy development of economic growth, talent development, infrastructure and governance issues. Daniel Miles, Ph.D., is a Vice President and Associate Principal at Econsult Solutions, Inc. At ESI, Dr. Miles leads economic analysis projects across a variety of sectors and industries. Prior to joining ESI, Dr. Miles was a Senior Economist in the New York office of Oxford Economics. Dr. Miles received his Ph.D. in Policy with a concentration in Economics from the University of Maryland, Baltimore County.